A recent draft report released by the Australian government's nuclear taskforce giving the green light to a nuclear powered future for the country, has drawn criticism from significant sectors of the community concerned that the report fails to address the issue of nuclear power plant safety. The Howard government commissioned the energy inquiry — led by former nuclear physicist Ziggy Switkowski — to examine nuclear power as a viable, safe, and relatively clean alternative source of energy to the country's heavily polluting, carbon-emitting coal industry. The taskforce controversially found that it would be feasible to build 25 nuclear power stations around the country by 2050 with an estimated one-third of Australia's electricity derived from nuclear energy by this time. However, the subsequent issue of the location of the nuclear plants — proposed to be near population centers on the coast because the reactors need water for their steam turbines and cooling systems — has been raised by environmentalists, opposition groups, and the state governments. Leaders of the Labor-held state administrations have unanimously opposed the building of nuclear power plants near major cities due to the risk of large-scale nuclear accidents like Chernobyl or Three Mile Island occurring near densely populated regions. "While ever I'm premier, there will not be nuclear power stations in New South Wales," said Morris Iemma, the premier of Australia's most populous state who is leading the criticism of the taskforce's findings. "We have legislation in place that bans them, and we're not changing that at all," he said to ABC national radio. Switkowski though, in an address to the National Press Club, called the nuclear option a "mature, safe, and relatively clean means of generating base load electricity." He added that his taskforce had visited Chernobyl and Three Mile Island and had concluded that although "no industry is risk-free, the nuclear industry is far safer than other energy-related industries." 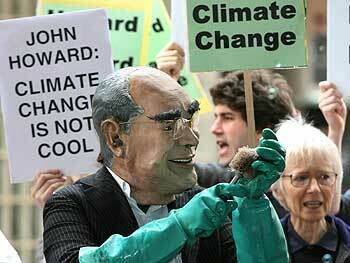 Prime Minister John Howard welcomed the report calling it "one weapon in the armory" in the fight against climate change. "The most important thing is that we have a proper debate about climate change and that proper debate must include a root and branch consideration of the contribution that nuclear power can make," said Howard while on an official visit to Vietnam. "It's quite unrealistic to talk about fighting the problem of greenhouse gas emissions unless you are open-minded and progressive and forward looking enough to look at each and every available alternative. There's no one single solution to the problem of climate change. You need every weapon in the armory, and one of them, of course, is obviously nuclear power," he said. Howard, long considered a climate change skeptic, has refused to accept that renewable energy such as wind and solar power can provide baseload (continual) power. However, sustainability experts have challenged this assumption calling the government's talking down of the potential of renewable energy misguided. Mark Diesendorf, director of the Sustainability Center at the University of New South Wales, called the inquiry's report "biased" and contended that renewable energy would be able to provide clean, baseload power to Australian consumers by 2050. "The study that my colleagues and I did, show that we could have half of our electricity produced from renewable sources by the same period of time, without nuclear power, without even so-called 'clean coal,' " said Diesendorf on The World Today radio program. "… Setting up this whole thing as a debate between coal and nuclear is a really false premise. With energy efficiency and renewable energy, we could halve our greenhouse gas emissions by 2040 and we could go on from there. But the problem is that the federal government at present is running an attack, a series of attacks on renewable energy, pretending that it can't provide baseload power, pretending that it is all intermittent, and all these things are untrue," he said. The taskforce's divisive report, though only released in a draft form, has generated heated debate in Australia. Switkowski and his team will now accept public submissions before producing its final report at the end of the year.